Left Dec’14 Right Dec’16 – 59lbs difference! I can honestly say that there have been 2 times in my adult life when I have been comfortable in my own skin. During both times I was focussed on good nutrition, so no point, calorie or macro tracking. Just making fresh food that hasn’t been processed and giving my body what it needs. The picture you see above is me (and Mr Burble) at both of those times. 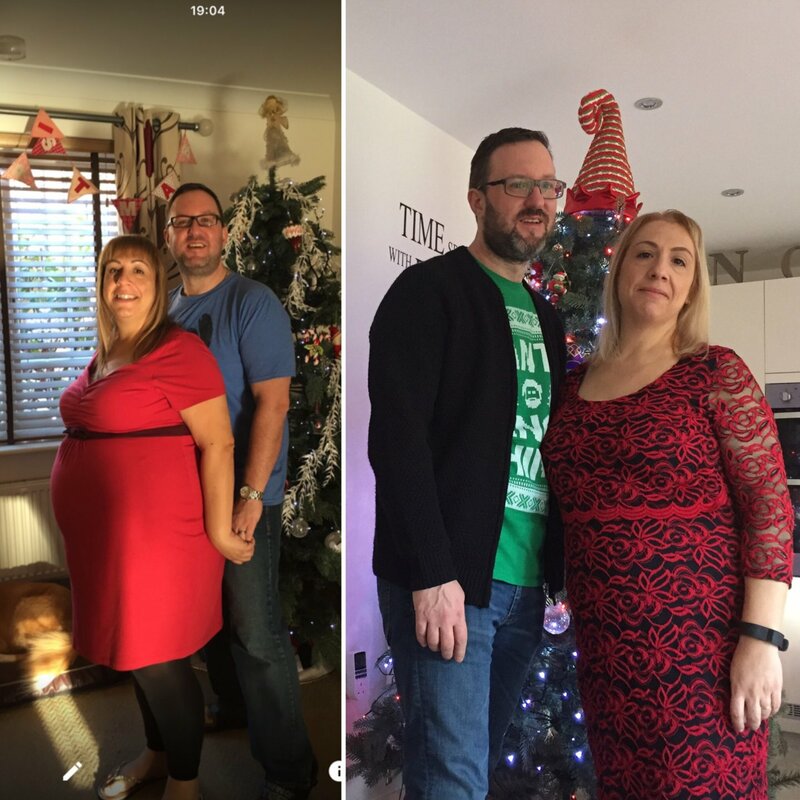 The first was taken on Christmas Day 2014 and the second was taken on Christmas Day 2016. So the first occasion, it’s Christmas Day 2014 and I’m pregnant with my twin sons, happily unaware that our sons would be arriving in around 4 weeks, a little sooner than expected! I’m an older mum of twins (44 years old) and it’s drummed into you by your midwife and consultant that because of my age and higher weight I was at risk of experiencing a number of complications, ranging from gestational diabetes, pre eclampsia, premature delivery and the list goes on. My age was something I couldn’t change, but my weight was totally in the realms of my control. I didn’t want my weight to spiral out of control during my pregnancy and I had to deal with my issues surrounding food, so I took the step of getting some help. I made a block of appointments with a hypnotherapist. I know I know, the hypnotherapy bit was funny. It took all of my energy not to laugh at the Hypno-voice, but saying some things out loud that have bothered me for years, having to explain these feelings to a total stranger suddenly made me see how silly it was to let those things rule and define me. He gave me a technique to deal with those thoughts and feelings if they raised their ugly head again and I’m surprised I only had to use that technique a couple of times. I gained 27 lbs during my pregnancy, this included the weights of my babies. On 26th January 2014 I weighed 16 st 12.5 lbs / 107kg / 236 lbs. I have never ever EVER weighed that much before, but I was carrying twins and hoped they were a good weight. I craved fruit and vegetables. Morning sickness struck at 5 months so it kept me on my toes, garlic and fried food made me sick. For the first time food to me was all about it’s nutrition. It was feeding me and my babies so I was totally focussed on what I was putting into my body. Gone was anything artificial. We went back to proper butter and I started baking my own bread that would after a couple of days go stale unlike the mass produced stuff! Benjamin and Leonardo were born on 27th January and by 31st March I was down to 14 st 10.2 lbs / 93.4kg / 206lbs – 30 lbs down from when my babies were born. It wasn’t down to dieting, I didn’t have time! I had 2 newborns who were feeding every 2 or so hours and one of them took up to an hour to feed. Whilst it was great to drop a substantial amount of weight quite quickly with seemingly no effort, it’s just a shame I was still very overweight. So I made a promise to my body that I would look after it after it had brought 2 healthy baby boys into the world safely. They were premature, born at 34+5, but they were strong enough not to need any help from the neonatal team. The neonatal registrar didn’t believe her team and came to see my babies for herself. We were discharged from the maternity unit but i was soon to return by ambulance with an infection. I was exhausted and remained exhausted for months of night feeds, colic and I can honestly say that I felt like a zombie for the first 6 months of being a mum. It was at this time that I should have taken better care of myself, but the babies came first and I came last. When I finally got my act together I realised that I had to take better care of myself, to reduce my weight and also the chances of getting an obesity related health issue. Now that I knew what I had to do, I had to find a way to do it in a sustainable way that allowed me to eat real food, to still have a cup of tea and enjoy the odd treat now and then. My approach to 90 day SSS has been a simple one; to complete the plan in a way that is sustainable after I’ve finished. So with this in mind the workouts had to be enjoyable and varied (tick), the food had to be easy to make, varied, tasty and the real important factor was I had to be eating ‘real’ food that I would want to continue to eat. For me to succeed I had to come up with lean versions of things I like to eat. The problem I’ve had in the past is knowing how to create a healthy plate of food while at the same time being tasty, the correct portion size and something I actually wanted to eat. I would start off ok, but then I would add flourishes, garnishes and I ended up adding another few hundred calories to the dish. Over the course of a week that can add up and of course with no expert to help create a calorie deficit necessary to lose weight, I was spiralling out of control taking Mr Burble with me. My past weight loss crimes include the likes of The Cambridge Diet, meal bars, soups (painstakingly made into crisps with the microwave-shoot me!) and shakes. I remember becoming obsessed with food, the mere thought of a grilled chicken breast with a small salad drove me wild. But as soon as we finished, it went to pot very quickly and I hadn’t learned how to live after and exercise never played a part of that diet fail. So getting back to 90 Day SSS – I almost threw the towel in during cycle 1 of my first round. I’ve admitted that I didn’t enjoy the set recipes and eventually reverted to adapting some of Joe’s book recipes to muddle through. Also in the process I tried a few of his (Joe’s) protein powder based puddings to soften the process and provide the occasional sweet treat, but they were horrible (apologies to anyone who loves them). A mug cake made with a chocolate protein powder tasted soapy, ice cream made with vanilla protein powder and almond milk was an assault on my tastebuds and an insult to ice cream makers everywhere and Mr Burble mixed protein powder with Greek yogurt. Enough already! There wasn’t a chance that I could eat those on the plan and it made me all the more determined to make a success of cycles 2 and 3. I worked hard to adapt recipes I’d been making for years. Using my pick and mix list to turn my old calorie packed dishes into lean versions. Mr Burble could see that I was struggling on cycle 1 and one day presented me with a website and gave me carte blanche to do with it what I wanted. The only thing I knew I could do was to document my recipes, add the images I’d posted to my instagram posts and share them with others on the plan. And so mydietburble.com came to be. So lets get up to date. I’ve already graduated from 90 Day SSS once but signed up to do it all again. 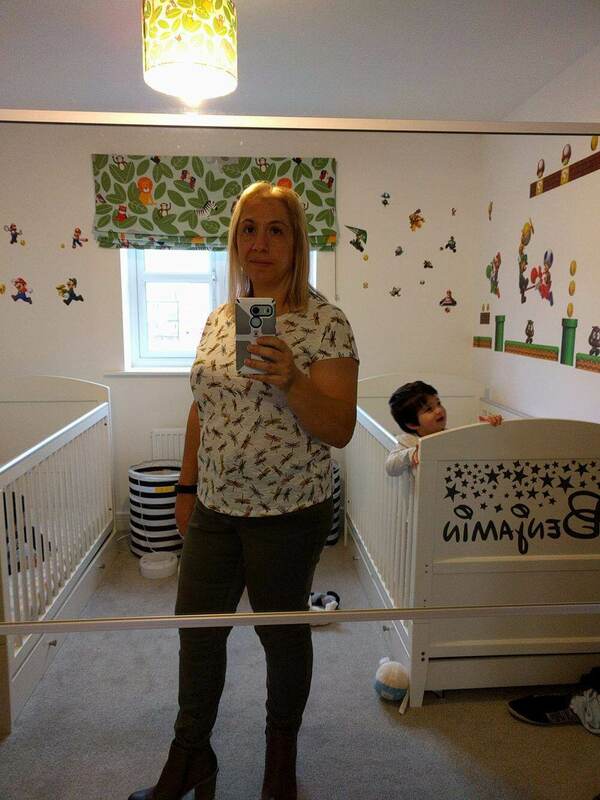 I’m currently 12 st 9.8 lbs / 80.3 kg / 177 lbs, down 59lbs since my babies were born (WTF!, that’s over 4 stone, I never realised until writing this blog post!). Christmas was approaching and my body confidence had improved so during a shopping trip I saw a dress that I liked. I grabbed a size 12 and 14 and headed to the changing room totally expecting to return empty handed as normal. 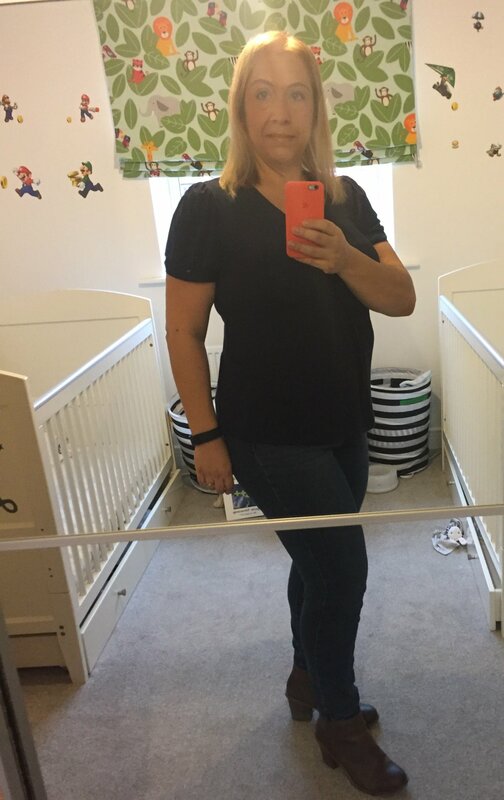 While the size 12 got stuck and didn’t go past my chest, the size 14 did fit (kind of with a few lumps and bumps Spanx could make disappear as if by magic!) but I had a few weeks to reduce my lumps and bumps so as to eliminate the need to wear control underwear with the dress and feel body confident. During my last shopping trip before Christmas I was in M&S and decided I wanted some underwear to compliment my Christmas dress. Walking through the lingerie department I saw this set, I picked up a few bras in different sizes along with the corresponding under crackers and headed for the changing room. I’ll be honest with you, I’ve not done this in years! All underwear in recent years has been functional. Colour, style and how it made me feel was never a deciding factor. 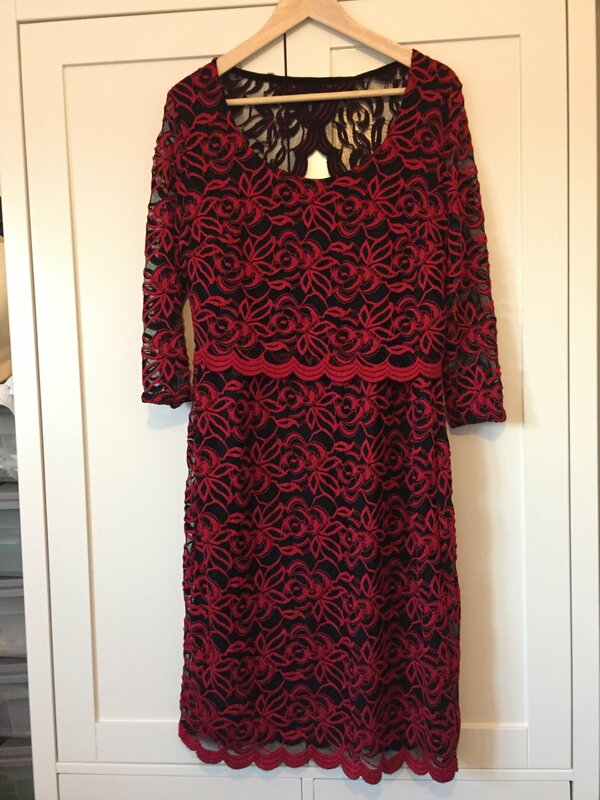 I had a lovely dress to wear on Christmas Day and I wanted to feel amazing, even down to my underwear. Christmas morning I showered and rough dried my hair, put some clean pj’s on and went to get my babies out of bed for their 2nd Christmas. We opened presents, put the turkey in the oven and watched the children play before getting dressed for the day. I had 30 minutes to finish my hair, put a bit of make-up on and get dressed. Its hard to describe the feeling as I walked down the stairs, it was like I’d been on a make-over show and this was my big reveal. I’m nowhere near my goal, in fact I don’t know what my goal is even. This is about me getting to a healthy, sustainable weight/size and staying there. On Christmas Day and all through the holidays I wasn’t worried about my mum-tum or looking bloated. I have a new body shape that I’m still getting used to but I didn’t feel the need to hide behind my children, a pillow or an apron when the cameras were out. I’ve enjoyed Christmas but I’ve been sensible and I’ve had no problems wearing my skinny jeans. No stretchy trousers have been necessary this year and I’ve even bought a size 14 petit winter coat!